Scour the web, and you will see many quotes about our eight-second attention span. You will find just as many studies calling it a myth. The truth is that learners don’t want to be bored. If they are bored, they will be distracted and easily lured into another activity. Think for a moment about how people access information every day. We are constantly surrounded by squirrels to chase. When reading an article, there is a hyperlink to click and new information that diverts our attention. Phones buzz with email and notifications from favorite social media sites. It’s in our nature: We don’t want to miss a thing. As learning and development professionals, squirrels are our nemesis. 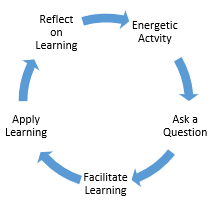 How do we bring back the energy and focus of our learners? The answer is a blast from the past. As learning and development professionals, squirrels are our nemesis. Some of your learners may not have had the best experience in school. If your room is set up classroom-style, it can cause anxiety in some learners and specific expectations in others. Subconsciously, they will all expect a lecture. A classroom set-up removes the responsibility for learning from the learner and places it on the instructor, but adult learners are ultimately responsible for learning the content. Let’s give them the best environment possible for the type of learning we bring. Consider a U shape or table pods, and consider changing where people sit after each break. Educational research shows that children who have attention challenges pay better attention when their learning environment includes activities before the learning actually begins. In our industry, we do icebreakers. Consider an activity that gets people moving around. It will improve the energy in the room and prepare your learners for engagement. 3. Ask Them What They Expect. Ask the learners what they are hoping to get out of the course. This question gives them a sense of control while you guide them on the learning path. Throughout the course, point to what you captured based on what they asked for. Every learning professional knows the importance of reading the room, but some learning groups are more focused than others. Remember that your learners are already walking into the room with divided attention: cell phones with important emails, business problems, etc. Be flexible enough to break your content into shorter time boxes (have a plan B). There is a reason that TED Talks are only 18 minutes long and that “Ignite”-style presentations (20 15-second slides) have become so popular. Remember that your learners are already walking into the room with divided attention. Use your space well, and eliminate clutter that could distract learners. Let them know up front when to expect a break. Knowing how long they are expected to be engaged actually helps them stay focused. Ask for their attention, and give ample breaks. A multimodal approach within your shorter time chunks can help focus attention. Consider an electronics charging station at the front of the room, far from where the learners are sitting. 6. Everything Is a Cycle. Ask a question about the topic they are learning, or tell a story about it. This activity helps learners recall their previous experiences and knowledge and gives you something to build on. Validate the importance of the topic, and then give learners the opportunity to apply their knowledge. Once course goals or milestones are met, allow reflection time and give people their well-earned break. Once course goals or milestones are met, allow reflection time and give people their well-earned break. 7. Use an Economy of Words, and Place Them Well. Say only what you need to. Be well-practiced and prepared, and get to the point. There is a theory in neuroscience called the primacy and recency effect, which states that the order in which we learn information determines our ability to reliably recall it and transfer it to long-term memory, and we learn best at the beginning and at the end. Apply this concept in your course planning. Put your impact at the beginning, do your activities in the middle, and review and reflect at the end. This approach will help your learners learn more effectively in a squirrel-chasing world. Put your impact at the beginning, do your activities in the middle, and review and reflect at the end. Loren Sanders is a senior advisor of learning and communications on the strategy team at CVS Health. She is also an adjunct faculty member at Lake Forest Graduate School of Management, where she teaches organizational communications and strategic talent management.